The nice thing about Google Reader is that I can keep up with the interesting things happening in Boston by virtue of what my friends up there randomly share. Ben recently shared an entry on the NPR Planet Money blog that really struck a chord with me. A developer working on a project in downtown Boston has run out of money. This, in and of itself, is not unusual. Happens all the time, especially these days. What struck me is that if you look at this photo I took when I was home in July, and compare it to the photo just posted to the blog, it looks like what I saw in July was as far as they got. Which means that they must have only ever had enough money immediately available to cover demolition. This really bothers me because this is a part of downtown that is a vibrant, interesting shopping and office area where all kinds of people collide — financial district types, grungy young nonprofit workers (I was one of them for a while), tourists, fancy people heading to Macy’s, Suffolk law students, artsy types from Emerson, groups of teenagers and, naturally, some of the local thug scene. As the blog post notes, a whole little row of small business was kicked out when this building (the former Filene’s building) was torn down. A lot of people never liked the project to begin with — even a couple of years ago, you could tell that the luxury condo market was getting saturated. And there’s always office space for rent in downtown crossing, despite how expensive it can be. So why more of the same? 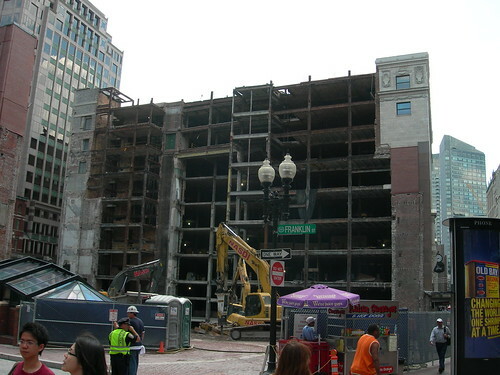 Now, instead of using the Filene’s building for some other retail giant (at one point there was talk of Target putting in a store there) or finding some other way to use it, there is just going to be a giant empty pit in the middle of Downtown Crossing. I wonder — if that’s the case, is it still the center of the universe? As the Globe’s coverage notes, this development was the centerpiece of (Mumbles*) Menino’s vision of a revitalized downtown area. For a variety of reason’s the Globe’s article is optimistic that the development will move forward soon enough, and some of the potential tenants seem to think that they will be able to move in, as planned, late this year or early next. But I just can’t help but wonder if this project is still on track or not. Can you realistically put up a 24-floor (at least) building within a year? I guess you could do it, but you wouldn’t be able to have every floor ready to be used within that time frame. Regardless, I think it’s safe to say that Bostonians as a whole are a pack of skeptical cynics, and we’re all giving this development, and the stories about how it’s still on track, a raised eyebrow.